India is a known country for its unique and rich cultures that’s reflected on different produced fabric kinds in the nation. Each Indian region has their own cultures in making different apparels by also using different fabrics. Among the regions, Jaipur is the most popular one because of the fabric they use not only in their cloths but also for bed sheets, double bed sheet, cushion, covers, and many other home decorating goods. The textiles from Jaipur are well-known from all over the world because of its beautiful and colorful designs as well as its superiority and flamboyance. Jaipur is a known leading exporter and manufacturer of various textile varieties. As a matter of fact, Jaipur fabric is used to form several arts in order to beautify them. The Jaipur products or textiles are famed definitely because of its color, prints, pattern and designs. The primary reason why the Jaipur fabric is considered as the best in India is due to its exceptional making process before the creation of the final product. The distinctive and innovative making method of the fabric as well as its several styles are 100% unique, which cannot be developed or made in other regions of India. Some of the textiles are handmade with the famous embroidery base and block print bed sheets that’s why they blend well and look good with other home decorations. Because of the hard work of people who are responsible in making these fabrics to be combined with its intricate process, the Jaipur fabric is becoming more and more in demand as what it is before especially the Bandej fabric. Bandej fabric is one of the in demand and most popular fabric used for block print bed sheet all over the world because the process of making this fabric involves the tying of fabrics before its of dyeing then afterwards, converting it to what’s called bandej fabric. This fabric is available in different colors and designs which is perfect for clothing and double bed sheets. With these kind of textiles, you will surely have a comfortable sleep by knowing that you are sleeping in a clean and high quality textile. Furthermore, you will also have a great morning by seeing its colorful and lively designs. Jaipur fabric as one of the leading exporter and manufacturer of Jaipur textile, already reach the online world in order to make the ordering process of these products in a much easier way. 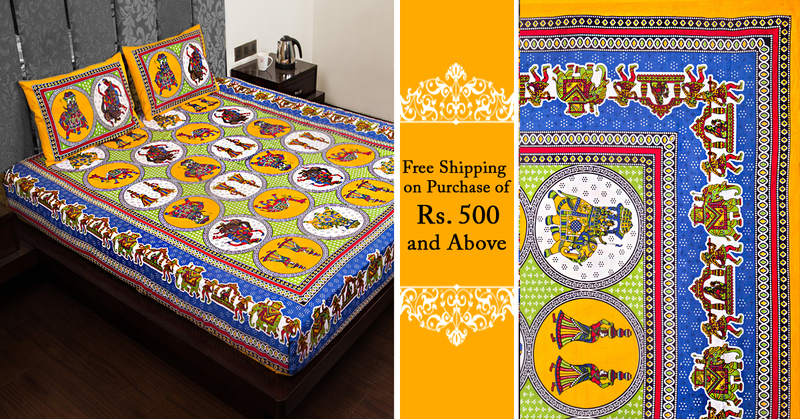 Aside from double bed sheets, they also offer cushion covers, and quilts or razai. These are also handmade which will surely match whatever design you have in your bedroom, or living room. These products are guaranteed handmade and only used top quality Jaipur fabrics in making one. In case you don’t know, a quilt is a type of blanket that is quilted in 3 fiber layers: one layer of batting or wadding, cloth top and woven back. The Jaipur fabric textiles are produced attractively in colorful patterns. No matter what you choose, a double bed sheet or a block print bed sheet, you can still enjoy its comfort and a bit taste of elegance.